"My mom and I would often make this yummy and easy peach crisp using her home-canned peaches when I was little." Arrange peaches evenly in an 8x8-inch baking dish. 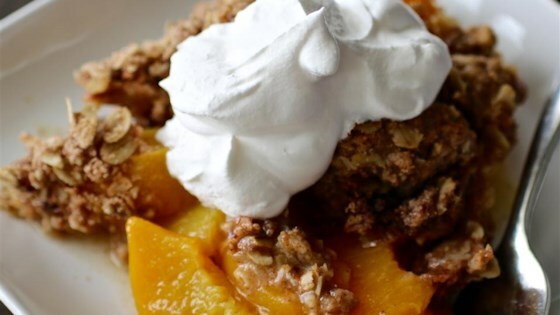 Try this simple yet delicious and comforting peach crisp. Used frozen peaches. Wonderful recipe!!!! Will use this again. I added pecans crushed to the top and cooked this in cupcake tins with silver liners. It took the same amount of time, just made small to prevent *accidently* overeating. They freeze well.